Spanish railway workers will stage a nationwide strike on 21 December and 7 January during the busy Christmas holiday period over job cuts and working conditions, a union said Tuesday. 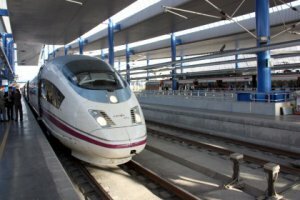 The ‘main reason’ for the strike is the ‘continued reduction in the number of staff’ at state train operator Renfe and state rail infrastructure company Adif, the CCOO union, one of the main trade unions representing rail workers, said in a statement. ‘We are mobilising to recover the jobs which have been lost, improve purchasing power and ensure agreed pay increases come into effect,’ said Manuel Nicolas Taguas, general secretary of the railway workers sector at the CCOO. The union says that since 2005 the workforce employed by the two companies in charge of Spain’s rail network has been slashed by around 5,000 workers to roughly 26,000 employees. The union representing Renfe rail guards has called a one day strike on 14 December to protest working conditions.